Simple, dependable, impervious to the elements, core, keepin' it real... Whatever the reason that brought you to riding a single speed, this is the place to check out rigs and projects. Share what you've got! One speed. Flip-flop hub, or "two-fer" type cogs OK, but no derailleured bicycles! Originally, I thought that would mean mostly mountain bikes, but if the gallery seems to have been populated with a number of single speed roadsters and mixed terrain one geared rigs - whatever you've got , send it on in. #300 - Ron Hampel's Rivendell Quickbeam - Milestone! #297 - Ana Semijalac's Unis Sport "Slim"
#293 - Nicola Guglielmi's "Going Merry"
#269 - Frank Cava's "Old Glory"
#211 - Spacer Conrad's Bridgestone 200 "Ramp Rat"
#209 - Richard Risemberg's "Trevor Wong"
#200 - Karen M's Raleigh Competition GS - Milestone! #178 - Tom Waterman's Cannondale "Frankendale"
#115 - Mitch's Schwinn "Track Racer"
#94 - Cameron Pease's Takara "Barney"
#65 - Ron Lau provides a Bilenky "Sneak Peak"
#39 - Dustin Sharp's Surly Cross-Check "BurkinaBike"
#8 - Clint Loper's Peugeot "Townie"
Want to make sure you don't miss any updates? New additions are featured at Cyclofiend.blogspot.com and announced on the Cyclofiend Twitter stream. Last Chance at the Original Color! 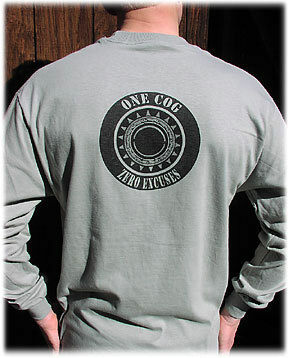 Be the first on your block to own a "One Cog - Zero Excuses" T-shirt. Completely compatible with both fixed-gear or singlespeed riding. Want to make sure you don't miss any updates?